Scroll down for Greyhound Locations listed by state. 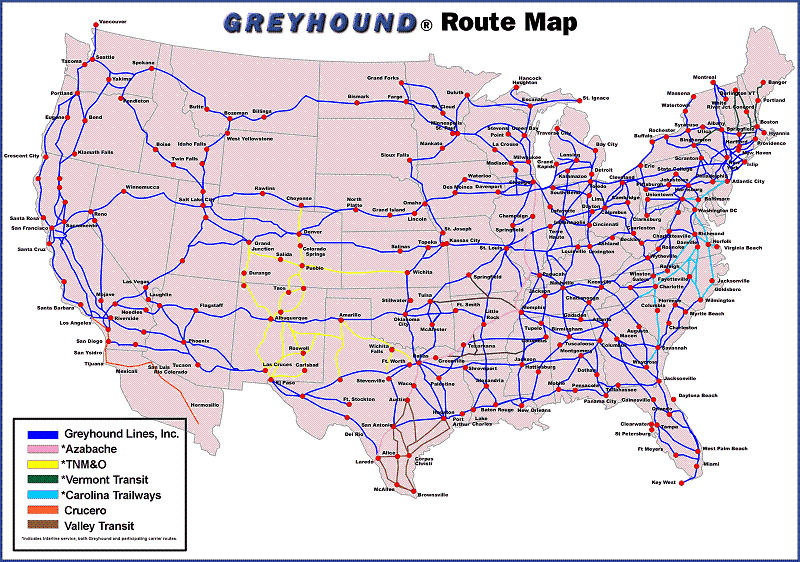 Shown above is a free printable greyhound route map. Abbeville, Alexander City, Alexandria, Andalusia, Anniston, Athens, Atmore, Bay Minette, Birmingham, Brent, Butler, Camden, Childersburg, Creola, Demopolis, Dothan, Enterprise, Eufaula, Eutaw, Evergreen, Fort Payne, Gadsden, Greensboro, Grove Hill, Huntsville, Jackson, Livingston, Marion, Mobile, Montgomery, Moundville, Mount Vernon, Opelika, Pell City, Pine Hill, Selma, Sylacauga, Thomasville, Troy, Tuscaloosa, Uniontown, York. Benson, Bullhead City, Casa Grande, Cocopah, Flagstaff, Gadsden, Gila Bend, Glendale, Holbrook, Kingman, Mesa, Phoenix, Quartzsite, San Luis, Somertown, Tolleson, Tucson, Wellton, Yuma. Bald Knob, Benton, Blytheville, Camden, Clinton, Conway, De Queen, Eldorado, Fayetteville, Fordyce, Forrest City, Fort Smith, Harrison, Hot Springs, Jonesboro, Little Rock, Lockesburg, Malvern, Marked Tree, Mena, Newport, Pine Bluff, Rogers, Searcy, Sheridan, Texarkana. Anaheim, Antioch, Arcata, Atascadero, Avenal, Bakersfield, Banning, Barstow, Blythe, Calexico, Chico, Claremont, Colfax, Crescent City, Delano, Ducor, El Cajon, El Centro, El Monte, Escondido, Eureka, Exeter, Fairfield, Farmersville, Fresno, Garberville, Gaskett, Gilroy, Goshen Junction, Grover Beach, Hanford, Hayward, Hiouchi, Indio, Isleton, Kettleman City, King City, LeMoore, Lindsay, Lodi, Long Beach, Los Angeles, Los Banos, Madera, Marysville, Merced, Modesto, Mojave, North Hollywood, Oakland, Oceanside, Oroville, Oxnard, Palm Springs, Palmdale, Perris, Pittsburg, Porterville, Red Bluff, Redding, Rio Dell, Rio Vista, Riverside, Roseville, Sacramento, Salinas, San Bernardino, San Diego, San Fernando, San Francisco, San Jose, San Luis Obispo, San Rafael, San Ysidro, Santa Ana, Santa Barbara, Santa Cruz, Santa Maria, Santa Rosa, Smith River, Stockton, Strathmore, Suisun City, Temecula, Terrabella, Tracy, Truckee, Tulare, Turlock, Ukiah, Victorville, Visalia, Watsonville, Weed, Willits. Alamosa, Buena Vista, Burlington, Colorado Springs, Craig, Denver, Dinosaur, Fairplay, Fowler, Frisco, Fort Collins, Fort Morgan, Glenwood Springs, Granada, Granby, Grand Junction, Greeley, Gunnison, Hayden, Hot Sulfur Springs, Idaho Springs, Kremmling, La Junta, Lamar, Las Animas, Milner, Moffat, Pine Junction, Poncha Springs, Pueblo, Rocky Ford, Salida, Springfield, Steamboat Springs, Sterling, Trinidad, Vale, Walsenburg, WInter Park. Bridgeport, Canaan, Danbury, Enfield, Farmington, Foxwoods, Hartford, Mansfield, Mohegan Sun Casino, New Britain, New Haven, New London, Southbury, Stamford, Storrs, Torrington, Waterbury, Winsted. Belle Glade, Big Pine Key, Chiefland, Clewiston, Crystal River, Daytona Beach, Delray Beach, Fort Lauderdale, Fort Myers, Fort Pierce, Fort Walton Beach, Gainesville, Hastings, Hawthorne, Interlachen, Islamorada, Jacksonville, Key Largo, Key West, Kissimmee, Labelle, Lake City, Lakeland, Marathon, Melbourne, Miami, Naples, Ocala, Orange Park, Orlando, Palatka, Panama City, Pensacola, Perry, Port Charlotte, Sarasota, Spring Hill, St. Augustine, St. Petersburg, Tallahassee, Tampa, Titusville, West Palm Beach. Albany, Athens, Atlanta, Augusta, Brunswick, Columbus, Conyers, Dalton, Fort Gordon, Gainesville, Greensboro, Hinesville, La Grange, Macon, Madison, Marietta, Monroe, Norcross, Savannah, Thomasville, Thomson, Unadilla, Tifton, Trenton, Unadilla, Valdosta Washington. Blackfoot, Boise, Burley, Cascade, Coeur d'Alene, Cottonwood, Craigmont, Donnelly, Dubois, Grangeville, Horseshoe Bend, Idaho Falls, Jerome, Kellogg, Lewiston, McCall, McCammon, Moscow, Mountain Home, Nampa, New Meadows, Pocatello, Rexburg, Riggins, Rupert, Swann Valley, Twin Falls, Whitebird. Augustana College, Bloomington, Carbondale, Champaign, Chicago, Danville, Decatur, Effingham, Freeport, Galena, Galesburg, Kankakee, La Salle, Marion, Markham, Mattoon, Moline, Monmouth, Mount Vernon, Naperville, Ottawa, Peoria, Quincy, Rockford, Springfield, Stockton, Vienna. Anderson, Bedford, Bern, Bloomington, Burns Harbor, Columbia City, Corydon, Dale, Decatur, Elkhart, Evansville, Fortville, Fort Wayne, Franklin, Gary, Goshen, Greenfield, Greenville, Hammond, Indianapolis, Kokomo, Lafayette, Lapaz, La Porte, Liberty, Ligonier, Ligonia, Loogootee, Marion, Martinsville, Merrillville, Michigan City, Muncee, Nappannee, New Albany, New Paris, Orleans, Palmyra, Paoli, Pendleton, Peru, Plymouth, Portland, Princeton, Remington, Richmond, Rochester, Rolling Prairie, Rushville, Shelbyville, South Bend, Spencer, Terra Haute, Valparaiso, Vincennes, Wakarusa, Warsaw, Washington, Westfield. Bloomfield, Burlington, Cedar Rapids, Clarinda, Clear Lake, Davenport, Des Moines, Dubuque, Dudley's Corner, Fairfield, Fort Dodge, Fort Madison, Grinnell, Iowa City, Keokuk, Lamoni, Marshalltown, Mason City, Monroe, Mt. Pleasant, Muscatine, Osceola, Oskaloosa, Ottumwa, Shenandoah, Sioux City, Tama, Walcott Junction, Waterloo, Webster City, Williams. Chanute, Coffeyville, Dodge City, Emporia, Garden City, Goodland, Greensburg, Hays, Hutchinson, Iola, Junction City, Kingman, Lawrence, Lindsborg, Manhattan, McPherson, Newton, Pratt, Salina, Syracuse, Topeka, Wichita. Ashland, Berea, Bowling Green, Elizabethtown, Frankfort, Fulton, Lexington, London, Louisville, Madisonville, Marion, Mayfield, Morganfield, Owensboro, Paducah, Sonora, Sturgis. Alexandria, Baton Rouge, Grambling, Lafayette, Lake Charles, Mindon, Monroe, New Orleans, Opelousas, Ruston, Shreveport, Slidell, St. Francisville. Augusta, Bangor, Bath, Belfast, Bridgewater, Brunswick, Camden, Caribou, Damariscotta, Houlton, Howland, Lewiston, Lincolnville, Mars Hill, Medway, Monticello, Oakfield, Old Town, Portland, Presque Isle, Rockland, Searsport, Sherman, Waldoboro, Waterville, Wiscasset. Aberdeen, Annapolis, Baltimore, Cambridge, College Park, Cumberland, Eastern Shore, Easton, Edgewood, Elkton, Frederick, Frostburg, Grantsville, Hagerstown, Hancock, Havre de Grace, Kent Island, Laurel, Mardela Springs, New Carrollton, Northeast, Ocean City, Ocean Pines, Perryville, Salisbury, Silver Spring, Towson, Vienna, Whitemarsh. Amherst, Boston, Bourne, Buzzards Bay, Deerfield, Duxbury, Eastham, Fall River, Fallmouth, Framingham, Great Barrington, Greenfield, Hampshire College, Harwich, Holyoke, Hyannis, Kingston, Lee, Lenox, Leominster, Lowell, Marshfield, New Bedford, Newburyport, North Eastham, North Truro, Northampton, Orleans, Pittsfield, Provincetown, Sagamore Circle, Sheffield, Six Flags New England, Somerset Park, South Hadley, South Wellfleet, Springfield, Stockbridge, Sturbridge, Truro, Wellfleet, Williamstown, Woods Hole, Worcester. Albion, Alma, Alpena, Ann Arbor, Au Gres, Baraga, Battle Creek, Bay City, Benton Harbor, Big Rapids, Boyne Falls, Cadillac, Cedar River, Cedar Springs, Champion, Charlevoix, Cheboygan, Clare, Crystal Falls, Detroit, East Lansing, Engadine, Escanaba, Flint, Gaylord, Gladstone, Grand Rapids, Grayling, Gwinn, Hancock, Harrisville, Holland, Houghton, Howard City, Iron Mountain, Iron River, Ironwood, Ishpeming, Jackson, Kalamazoo, Kingsley, Kincross, L'Anse, Lansing, Lincoln Park, Mackinaw City, Manistique, Manton, Marquette, Menominee, Morley, Mt. Pleasant, Muskegon, Newberry Oscoda, Ossineke, Owosso, Pawpaw, Pellston, Perry Junction, Petoskey, Pontiac, Powers, Reed City, Rockford, Rogers City, Saginaw, Sault Ste. Marie, South Haven, Southfield, St. Ignace, Standish, Stanwood, Strongs Corner, Tawas City, Traverse City, Wakefield, Watersmeet, Wayne, Ypsilanti. Aitkin, Albert Lea, Alexandria, Andover, Austin, Bagley, Bemidji, Blaine, Brainerd, Burnsville, Cass Lake, Clara City, Cloquet, Crookston, Crosby, Detroit Lakes, Dodge Center, Duluth, Eden Prairie, Erskine, Fairmount, Faribault, Fergus Falls, Forest Lake, Fosston, Glencoe, Glenwood, Grand Rapids, Granite Falls, Hibbing, Hinckley, Hutchinson, Jackson, Litchfield, Little Falls, Luverne, Mankato, Maple Grove, Marshall, McGregor, Minneapolis, Moorhead, Rochester, St, Cloud, St. Paul, University of Minnesota, Moorhead, Moose Lake, Morris, Nisswa, North Branch, Owatonna, Pequot Lakes, Perham, Pine City, Pine River, Pipestone, Rochester, Sandstone, St. Cloud, St. Paul, Staples, Starbuck, Virginia, Wadena, Walker, Waseca, Wilmar, Winona, Worthington. Belzoni, Biloxi, Brookhaven, Clarksdale, Cleveland, Durant, Greenville, Grenada, Gulfport, Hattiesburg, Indianola, Jackson, Meridian, Mt. Olive, Natchez, Pascagoula, Port Gibson, Rolling Fork, Tunica Junction, Tupelo, Vicksburg, Woodville, Yazoo City. Bethany, Bolivar, Boonville, Bowling Green, Branson, Cabool, Cameron, Canton, Cape Girardeau, Clinton, Collins, Columbia, Ft. Leonard Wood, Hannibal, Harrisonville, Humansville, Jefferson City, Joplin, Kansas City, Kirksville, Lebanon, Licking, Macon, Maryville, Moberly, Mountain Grove, Neosho, Nevada, Osceola, Rich Hill, Rolla, Sikeston, Springfield, St. Joseph, St. Louis, Troy, Warrensburg, Wentzville. Arlee, Basin, Billings, Boulder, Bozeman, Butte, Cascade, Craig Junction, Dillon, Evaro, Glendive, Great Falls, Helena, Kalispell, Lakeside, Lima, Livingston, Melrose, Miles City, Missoula, Pablo, Polson, Ravalli, Sidney, St. Ignatius, St. Regis, Ulm Junction, Whitefish, Wolf Creek. Aurora, Columbus, Fremont, Grand Island, Humphrey, Kearney, Lexington, Lincoln, Madison, Norfolk, North Bend, North Platte, Ogallala, Omaha, Schuyler. Batle Mountain, Elko, Henderson, Las Vegas, Lovelock, Reno, Wendover, Winnemucca. Berlin, Center Harbor, Concord, Conway, Dover, Franconia, Gorham, Hanover, Jackson, Keene, Lebanon, Lincoln, Littleton, Manchester, Meredith, Moultonborough, Nashua, New Hampton, North Conway, North Londonderry, Pinkham Notch, Plymouth, Portsmouth, Salem, Tilton, West Ossipee. Allendale, Atlantic City, Camden, Hohokus, Mahwah, Mt. Laurel, Newark, Panther Valley, Paramus, Ramsey, Ridgewood, Showboat, Somerville, Trenton, Waldwick. Alamogordo, Albuquerque, Carlsbad, Clayton, Clovis, Deming, Gallup, Grants, Hobbs, Las Cruces, Lordsburg, Portales, Raton, Roswell, Ruidoso, Tucumcari. Albany, Alfred Station, Allaben, Almond, Ames, Amsterdam, Andes, Arkville, Ashland, Athens, Avon, Babylon, Batavia, Bearsville, Beckers Corner, Belleayre Mountain, Bethlehem, Big Indian, Binghamton, Bloomingburg, Bloomington, Bouckville, Bradleys Corners, Brisben, Brooklyn, Buffalo, Cairo, Canton, Catskill, Chenango Forks, Chester, Chestertown, Clarkson University, Clifton Park, Clinton, Coeymans, Colgate University, Cooks Falls, Cooperstown, Corning, Cortland, Coxsackie, Dansville, Davenport, Deansboro, DeKalb Junction, Delhi, Dryden, Dunkirk, Earlville, Ellicottville, Elmira, Evans Mills, Fallsburg, Ferndale, Fishkill, Fleischmanns, Fonda, Geneseo, Geneva, Glenmont, Glens Falls, Gloversville, Goshen, Gouvernour, Grand Gorge, Greene, Haines Falls, Hamilton, Hancock, Hannacroix, Harpersfield, Harriman, Hartwick Seminary, Hempstead, Hensonville, Herkimer, High View, Highland Mills, Highmount, Hinmans Corners, Hogansburg, Hornell, Hudson, Hunter, Huntington, Hyde Park, Islip, Ithaca, Johnstown, Kattleville, Keene, Kiamesha, Kingston, Lake George, Lake Hill, Lake Placid, Lake Ronkonkoma, Lexington, Liberty, Loch Sheldrake, Madison, Malone, Malta, Margaretville, Marist, Massapequa, Massena, Meridale, Mohawk, Monroe, Monticello, Morrisville, Mountainville, Mt. Morris, Mt. Tremper, Myers Corner, Napanoch, New Baltimore, New Hampton, New Paltz, New Rochelle, New York City, Newburgh, Niagara Falls, Norwich, Oneonta, Orange Plaza, Oriskany Falls, Oswego, Oxford, Palenville, Parksville, Patchogue, Paul Smiths, Phillipsport, Phoenicia, Pine Hill, Plattsburgh, Port Jervis, Postdam, Pottersville, Poughkeepsie, Prattsville, Pulaski, Quarryville, Queens, Queensbury, Ramapo, Ravena, Ray Brook, Rhinebeck, Richfield Springs, Rochester, Roosevelt Field, Rosendale, Salamanca, Saranac Lake, Saratoga Springs, Saugerties, Schenectady, Schroon Lake, Selkirk, Shady, Shandaken, Sherburne, Sonyea, Southfields, Spring Glen, Springville, Statsburg, Stamford, Stony Hollow, Summitville, Syracuse, Tannersville, Tillson, Utica, Vanderbilt, Wappingers Falls, Warrensburg, Watertown, Wawarsing, West Coxsackie, West Hurley, West Point, White Plains, Whitney Point, Willow, Windham, Woodbourne, Woodbury, Woodstock, Wurtzboro. Ahoskie, Appalachian State University, Asbury, Asheville, Boone, Charlotte, Concord, Durham, Edenton, Elizabeth City, Fayetteville, Gastonia, Goldsboro, Greensboro, Greenville, Henderson, Hickory, Jacksonville, Kings Mountain, Laurinburg, Lenoir, Lincolnton, Lumberton, Monroe, New Bern, Raleigh, Rockingham, Rocky Mount, Salisbury, Smithfield, Wadesboro, Wallace, Washington, Whiteville, Wilksboro, Wilmington, Wilson, and Winston-Salem. Bismarck, Dickinson, Fargo, Grand Forks, Jamestown, Minot, Stanley, Valley City, Williston. Akron, Ashtabula, Atens, Batavia, Cambridge, Canton, Cincinnati, Cleveland, Columbus, Coolville, Dayton, Defiance, Elyria, Findlay, Jackson, Kenton, Lancaster, Lima, Logan, Mansfield, Marietta, Marion, Marysville, Mt. Eaton, Nelsonville, New Philadelphia, Newcomerstown, Peebles, Piketon, Ravenna, Sandusky, Seaman-Winchester, Springfield, Toledo, West Salem, Wooster, Youngstown, Zanesville. Ardmore, Bartlesville, Bethany, Chickasha, Durant, El Reno, Elk City, Lawton, McAlester, Muskogee, Norman, Okalhoma City, Paul's Valley, Perry, Stillwater, Tulsa. Albany, Ashland, Astoria, Baker City, Bend, Brookings, Brothers, Buchanan, Burns, Cannon Beach, Cave Junction, Coos Bay, Corvallis, Drewsey Junction, Elsie, Eugene, Florence, Gearhart, Gold Hill, Grants Pass, Great Meadows, Hampton, Harper Junction, Hood River, Juntura, Klamath Falls, La Grande, Manning, McMinnville, Medford, Necanicum Junction, Newberg, Newport, O'Brien, Ontario, Pendleton, Philomath, Portland, Reedsport, Riley, Rosenburg, Salem, Seaside, Selma, Sisters, Stanfield, The Dalles, Tigard, Toledo, Vale, Warrenton, White City, Woodburn. Abington, Allentown, Allenwood, Altoona, Amity Hall, Ashland, Bath, Beaver Meadows, Berwick, Bethlehem, Big Run, Blairsville, Blakeslee, Blooming Grove, Bloomsburg, Blossburg, Bradford, Brodheadsville, Clearfield, Coaldale, Dallas, Danville, Delmont, Doylestown, Dubois, Duncannon, Easton, Edensburg, Edinboro, Effort, Erie, Frackville, Gillett, Greensburg, Harrisburg, Hazleton, Hellertown, Hometown, Honesdale, Hudsondale, Hughesville, Indian Orchard, Indiana, Jim Thorpe, Johnsonburg, Johnstown, Kane, King of Prussia, Kulpmont, Kutztown, Lancaster, Lansford, Lantz Corners, Latrobe, Lehighton, Lewisburg, Lewistown, Liberty, Liverpool, Lock Haven, Mahanoy City, Mainesburg, Mansfield, Matamoras, Meadville, Mifflintown, Millerstown, Milton, Monroeville, Mt. Carmel, Mt Pocono, Nesquehoning, New Buffalo, New Castle, Newport, Norristown, Penndot, Philadelphia, Philipsburg, Pittsburgh, Port Trevorton, Pottstown, Pottsville, Punxsutawney, Quakertown, Redding, Red Rock, Sanatoga, Schuylkill, Scranton, Selinsgrove, Shamokin, Shenandoah, Snydersville, St. Marys, State College, Stroudsburg, Sunbury, Sykesville, Sylvania, Tafton, Tamaqua, Thompsontown, Tobyhanna, Trout Run, Troy, Tyrone, Watsontown, Waynesburg, Wescosville, White Mills, Wilcox, Wilkes Barre, Williamsport, York, Zelienople. Middletown, Newport, Portsmouth, Providence, T.F. Green Airport (Providence). Aiken, Anderson, Beaufort, Camden, Charleston, Columbia, Dillon, Duncan, Florence, Ft. Jackson, Georgetown, Greenville, Myrtle Beach, Orangeburg, Spartanburg, Summerville, Sumter, Waterboro. Aberdeen, Brookings, Flandreau, Groton, Huron, Kadoka, Mitchell, Oacoma, Pierre, Rapid City, Sioux Falls, Sisseton Junction, Spearfish, Summit Corner, Vermillion, Vivian, Wall, Watertown, Webster. Also see Trailways and Jefferson Lines. Athens, Bristol, Chattanooga, Clarksville, Cleveland, Cookeville, Covington, Crossville, Dyersburg, Greeneville, Jackson, Johnson City, Knoxville, Nashville, Manchester, Memphis, Millington, Morristown, Murfreesboro, Nashville, Ripley, Union City. Abbott, Abilene, Alice, Alpine, Amarillo, Angleton, Aransas Pass, Atlanta, Austin, Bay City, Baytown, Beaumont, Beeville, Big Spring, Boerne, Bogata, Brady, Brownfield, Brownsville, Bryan, Buffalo, Carrollton, Center Point, Childress, Comfort, Conroe, Corpus Christi, Corsicana, Crane, Dallas, De Kalb, Denton, Deport, Domino, Dumas, Eden, Edinburg, El Campo, El Paso, Fairfield, Falfurrias, Fredericksburg, Freer, Friona, Ft. Stockton, Ft. Worth, Gainesville, Ganado, George West, Georgetown, Greenville, Harlingen, Hearne, Henderson, Hereford, Hidalgo, Hooks, Houston, Huntsville, Junction, Karnes Kenedy, Katy, Kerrville, Kilgore, Killeen, Kingsville, La Mesa, Laredo, Levelland, Linden, Livingston, Longview, Lubbock, Lufkin, Manvel, Marfa, Marshall, Mason, Mathis, McAllen, McCamey, McKinney, Mesquite, Mission, Mt. Pleasant, Nacogdoches, Nash, Navasota, New Boston, Odem Sinton, Odessa, Palacios, Paris, Pattonville, Pecos, Plainview, Pleasanton, Port Arthur, Port Lavaca, Prairie View, Premont, Presidio, Queen City, Raymondville, Refugio, Richardson, Rio Grande City, Riviera, Robstown, Rockport, Roma, Rosenburg, Round Rock, Salt Flat, San Angelo, San Antonio, San Marcos, Schulenburg, Seguin, Seminole, Sherman, Snyder, Sterling City, Sulphur Springs, Sweetwater, Talco, Temple, Terrell, Texarkana, Tyler, Van Horn, Vernon, Victoria, Waco, Wake Village, Waxahachie, Weatherford, Weslaco, Wharton, Wichita Falls, Zapata. Brigham City, Cedar City, Duchesne, Ft. Duchesne, Green River, Heber City, Logan, Myton, Ogden, Park City, Parowan, Provo, Richfield, Roosevelt, Salt Lake City, St. George, Tremonton, Vernal. Bellows Falls, Bennington, Brandon, Brattleboro, Bridgewater, Burlington, Colchester, Killington, Manchester, Menden, Middlebury, Montpelier, Quechee, Rutland, Sherburne, Wallingford, White River Junction, Woodstock. Charlottesville, Danville, Exmore, Farmville, Fredericksburg, Hampton, Lynchburg, Marion, Norfolk, Oak Hall, Petersburg, Richmond, Roanoake, South Boston, South Hill, Springfield, Virginia Beach, Williamsburg, Woodbridge, Wytheville. Addy, Arden, Bellingham, Brewster, Burbank, Centralia, Chelan Falls, Chewelah, Colfax, College Place, Colville, Deer Park, Discovery Bay, Ellensburg, Ephrata, Everett, George, Kelso, Kettle Falls, Kingston, Leavenworth, Loon Lake, Malott, Monroe, Moses Lake, Mt. Vernon, Okanogan, Olympia, Omak, Orondo, Pasco, Pateros, Port Angeles, Port Townsend, Pullman, Quincy, Ritzville, Seattle, Sequim, Skykomish, Spokane, Stevens Pass, Sunnyside, Tacoma, Touchet, Vancouver, Walla Walla, Wallula. Beckley, Bluefield, Charleston, Clarksburg, Clendenin, Fairmont, Huntington, Morgantown, Parkersburg, Ripley, Sutton Flatwood, Weston, Wheeling. Abbotsford, Appleton, Ashland, Baraboo, Beaver Dam, Brule, Chippewa Falls, Columbus, Dodgeville, Eau Claire, Fond du Lac, Goerkes Corner, Green Bay, Hurley, Iron River, Johnson Creek, Kenosha, La Crosse, Madison, Manitowoc, Marinette, Menomonie, Milwaukee, Mt. Horeb, Oconto, Oshkosh, Peshtigo, Platteville, Portage, Racine, Shawano, Sheboygan, Sparta, Stanley, Stevens Point, Superior, Tomah, Verona, Waukesha, Waupaca, Waupun, Wausau, Westfield, Wisconsin Dells, Wisconsin Rapids, Wittenberg. Alpine Junction, Basin, Buffalo, Casper, Cheyenne, Cody, Douglas, Evanston, Greybull, Jackson, Laramie, Lovell, Powell, Rawlins, Rock Springs, Sheridan, Shoshone, Thermopolis, Wheatland, Worland. 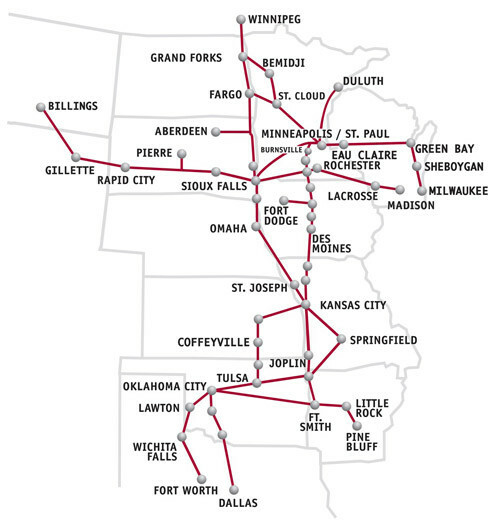 Also see the Jefferson Lines route map shown below. Visit this page for colorful Fact & Photo Galleries from All 50 States and Washington DC. Go here for Affordable Travel Deals to all 50 states and Washington DC.